We bought tickets for only €15 each at a discount based on our first purchase. 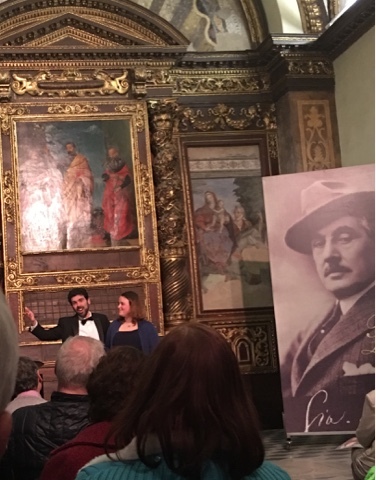 Last night featured a soprano, Ilaria Casai, and a tenor, Matteo Michi, accompanied by the same pianist, Diego Fiorini, in a program of "Mozart e Puccini." While excellent and enjoyable, it didn't seem quite as sublimely glorious as the previous night's performance, although the encore O Solo Mio duet brought the audience to their feet. Two nights of arias a 10-minute walk from "home" - what a treat!